Closely related to horses and donkeys, the zebra (subgenuses Hippotigris and Dolichohippus) is best known for its black and white striped body. In fact, zebra stripe patterns are unique to each individual. These stripes are believed to be camouflage devices that help zebras hide well in the grass. Overall, plains zebras number at around 750,000. Historically, there were over 15,000 Grevy's zebras. However, there are only about 2,500 remaining today. There are 600-700 cape mountain zebras and around 800-1300 Hartmann's mountain zebras in the wild. Plains zebra are found on the savannas from Sudan to northern Zimbabwe in eastern Africa. Grevy's zebras are now mostly restricted to parts of northern Kenya. Mountain zebras occur in southwestern Africa with cape mountain zebras in South Africa and Hartmann's mountain zebras in Namibia and Angola. 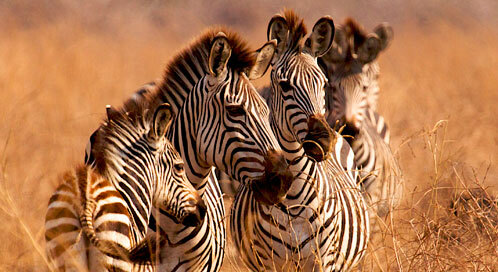 Zebras as very social animals and live in large groups called 'harems.' Plains and mountain zebras live in harems that are made up of one stallion and up to six mares and their young, while Grevy's zebras come together as groups for short periods of time. Sometimes herds come together to form temporary groups of up to 30 members. Zebras sleep standing up, and only when they are in groups that can warn them of danger. If they spot a predator, they will bark or whinny loudly to warn the others in the group. Mating Season: Year round and based on species. Zebra foals are born with brown and white stripes as opposed to black and white stripes. Mares generally keep all other zebras away for 2-3 days until her foal recognizes her by sight, voice and smell. The zebra's biggest threats are habitat loss due to ranching and farming and competition for water with livestock. They are also hunted for their skins. In the range of the Grevy's zebra, where survival of young is linked to the availability of forage, climate change is exacerbating droughts on already-degraded rangeland. Droughts also force the animals to congregate at remaining water sources, increasing the incidence of disease transmission.